Kubota has decades of experience in the mini excavator category, but in 2018 the company introduced the new U27-4 tight tail swing excavator. 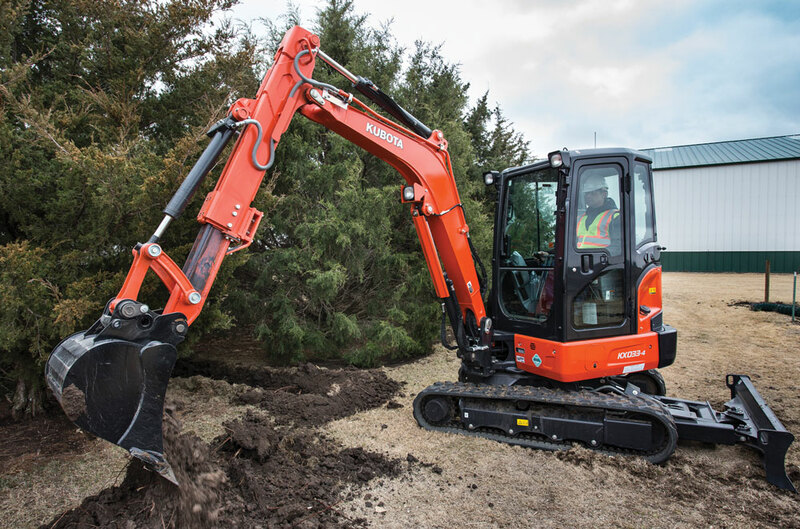 The U27-4 features adjustable auxiliary flow hydraulics, an auxiliary diverter valve, two-speed automatic downshift travel, as well as best-in-class reach and dig depth, says Kubota. The company also notes that the new U27-4 boasts one of the largest operator stations in its class with a tight tail swing design. An enclosed cab option with heat is also available for the new U27-4. The tight tail swing design on the U27-4 allows the compact excavator to maneuver and work in tight spaces where larger equipment can’t fit. The new excavator features powerful digging force combined with the ability to simultaneously operate the pilot-controlled hydraulic functions, making the workday more efficient and productive. The U27-4 is powered by a Kubota Tier 4 Final diesel engine, which is designed to minimize noise and vibration. Also new in 2018, Kubota introduced the KX033-4 with extendable dipper arm. 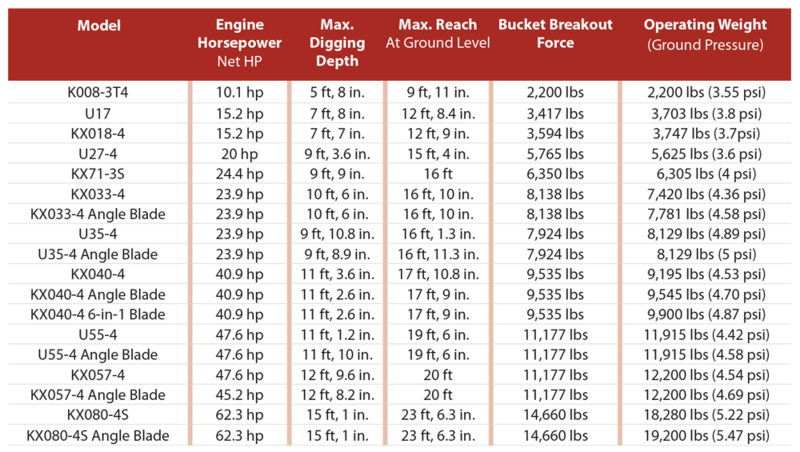 The new KX033-4 weighs in as a 3-ton-class machine yet boasts the reach and dig depth of a heavier weight class. Ideal for those hard-to-reach areas, the KX033-4’s optional extendable dipper arm can be quickly and easily extended up to 31 in., boosting productivity as well as efficiency. Its impressive capabilities include a digging depth of 12 ft, 2 in. and a digging reach of 18 ft, 3 in. The KX033-4 is powered by Kubota’s direct injection diesel engine that is engineered with the power to maximize digging and lifting performance while it minimizes noise, vibration and fuel consumption. The KX033-4 auto-downshift feature automatically downshifts from high to low, depending on traction and terrain, allowing smoother operation when dozing and turning. When the auto idling system is engaged and control levers are in neutral for more than four seconds, the engine will automatically idle; if the operator moves any lever, the rpm immediately returns. The standard auto idling system lowers noise and exhaust emissions and also reduces operating cost and fuel consumption. Learn more about Kubota here.